FIFA is considering Oman and Kuwait as hosts of some matches at the 2022 World Cup if the tournament, to be staged in Qatar, is expanded from 32 to 48 teams, the New York Times reported. The World Cup will be expanded from 32 to 48 teams in 2026 but FIFA president Gianni Infantino has proposed bringing forward the enlarged format to 2022. Germany are out-of contention for another international-trophy after France handed Joachim Lw's struggling team its latest-loss. The balance of power in European-football is swinging even further-away-from 2014 World Cup champion since their poor-title defence in Russia. World Cup winners France rallied for a comeback 2-1 win in UEFA Nations League against Germany, who fell to a-fourth-loss in their last-six-competitive games, sixth this calendar year. 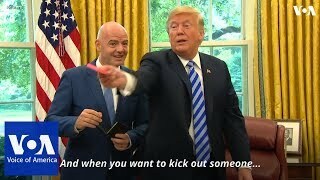 US President Donald Trump jokingly showed the media a red penalty card which was given to him by FIFA President Gianni Infantino during a meeting over the 2026 World Cup on Tuesday. "That's very good...I like that," Trump said after showing the card. The US will jointly host the 2026 FIFA World Cup along with Canada and Mexico.